Calvin L. Smith: "To the Jew First..."
I spent the weekend in Golders Green, London, visiting with Mitch Glaser and Chosen People Ministries (CPM). Mitch wrote the foreword to my recent book and we will be doing some more things together, which I will post details of here in due course. CPM is not so much a Christian Zionist group as a ministry founded in New York in the 1890s by a former rabbi for the express purpose of sharing the gospel with the Jewish people. Thus, for CPM Jewish evangelism takes precedence over issues such as the land and supercessionism, and the ministry now works in various locations outside New York, including the ministry I visited in Golders Green. I am passionate about Jewish evangelism. Romans 1:16, together with the whole of Paul's ministry as set out in the book of Acts, demonstrates our duty to share the gospel with God's historic people, and I strongly disagree with those Christian Zionists who choose not to share the gospel with the Jewish people on theological grounds. I'm not a dual covenantalist and believe there is only way of salvation... through Jesus, Yeshua. However, sharing the gospel in this way often leads to strong opposition from religious Jews. I've seen it many times, indeed experienced it first hand at, for example, the Western Wall. Ultra-Orthodox Jews throughout Israel and within Jewish communities react strongly - sometimes even violently - against "missionaries" and missionary activity, which they regard pejoratively as somehow an attempt to "Gentilise" Jews by encouraging them to ditch their Jewish religious heritage. 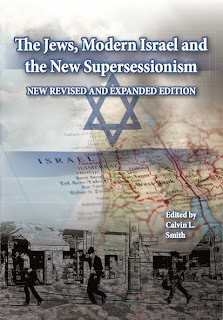 Indeed, it is not unusual to have the charge of anti-Semitism levelled against those who share the gospel with the Jewish people, so bitterly are the "missionaries" viewed. Of course, this is a complete nonsense. To be sure, there is a way to share the gospel which is not unnecessarily arrogant or insensitive, but sharing about the Jewish Messiah and the need to accept Him as saviour cannot be anti-Semitic. Indeed, Judaism is itself a proselatysing faith. Nonetheless, sharing the gospel in Israel can lead to all manner of problems, and just this week I received a letter from an evangelist friend of mine there hassled by the ultra-orthodox anti-missionay organisation Yad L'eachim. One is certainly reminded of how the early church, which was fully Jewish, was persecuted by the Jewish religious authorities in the book of Acts. And for those who take a broadly pro-Israel or anti-supercessionist line nothing will test your love of the Jewish people more than the reaction you will receive in some quarters for sharing the gospel with them. Mitch and others have recently produced a book on the whole issue of Jewish evangelism which I look forward to reading. I've already had a glance through and together with contributions from various well-known and respected theologians, it tackles the issue from a range of perspectives and disciplines. As such, this is a useful tool for all Christians, regardless of their theological view of Israel. Whether espousing Christian Zionism or supercessionism, I don't think you will find the book unpalatable, but rather quite useful and challenging. It is entitled To the Jew First: The Case for Jewish Evangelism in Scripture and History, edited by Darrell Bock and Mitch Glaser (Kregel Academic and Professional, 2008), with contributions from Richard A. Averbeck, Craig A. Blaising, J. Lanier Burns, Arnold Fruchtenbaum, Arthur F. Glasser, Walter C. Kaiser Jr., Kai Kjaer-Hansen, Barry R. Leventhal, Richard L. Pratt Jr., Michael Rydelnik, Mark A. Seifrid and David L. Turner.